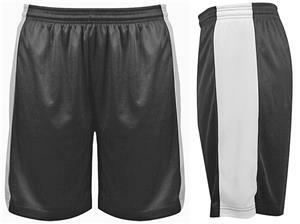 Badger Sport Womens Court Reversible Shorts. Each layer individually bottom hemmed for easy screening. 100% polyester moisture management/antimicrobial performance fabric. Contrast side panels. Double-needle hem. Covered elastic waistband with drawcord. Women's fit. Reversible. Waist 24-26" 26-28" 28-30" 30-32" 32-34" 36-38"